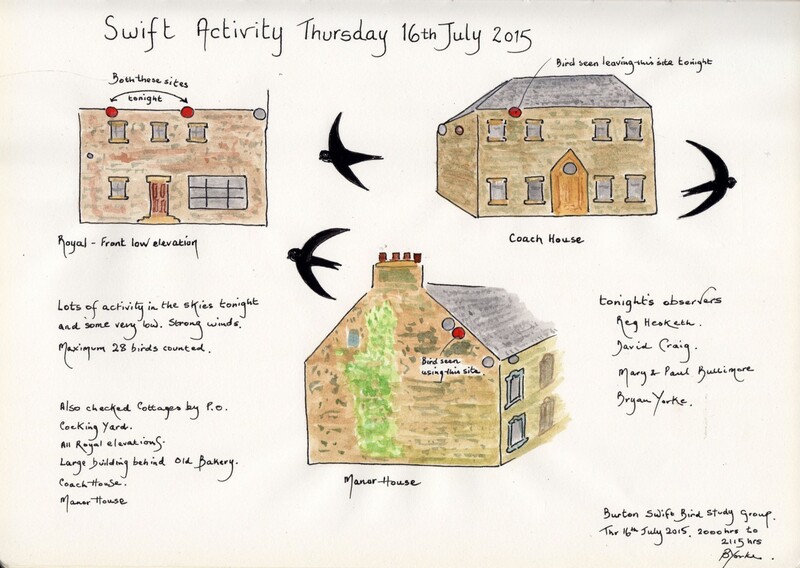 This is a sketch showing the Swift activity on Thursday 16th July 2015 during observations made by the group. 0745hrs A party of 13 moving East over Sandylands School, Heysham. 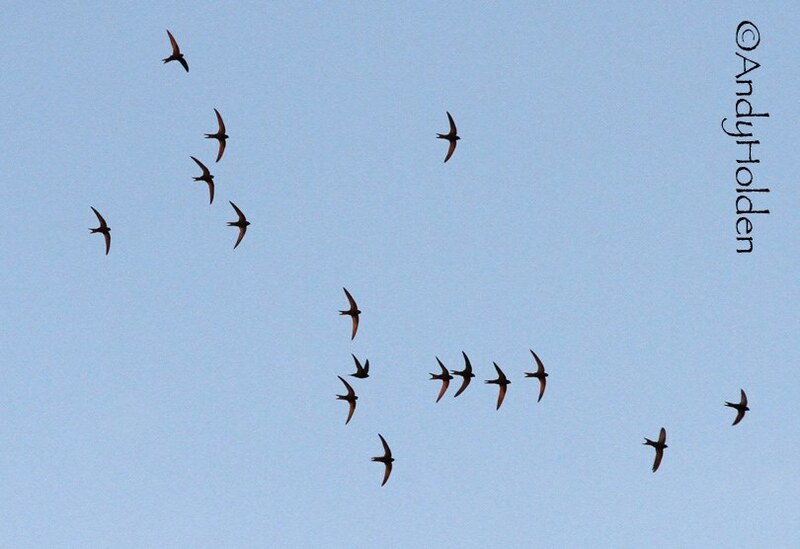 0945hrs 3 Swifts low over Clawthorpe Hall. 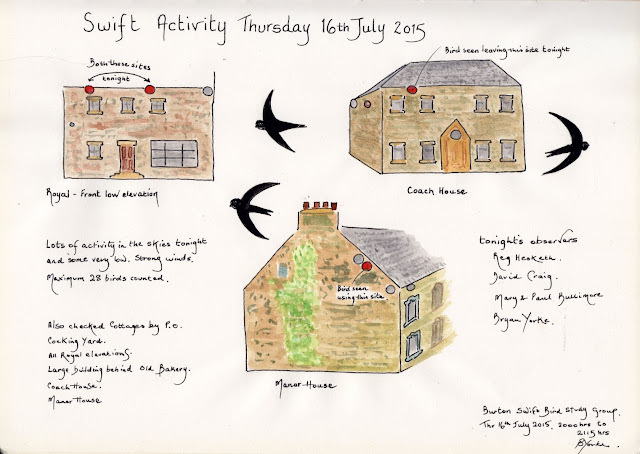 1115hrs 8 Swifts screaming in follow my leader fashion, flying low and over and in and out of the buildings at Clawthorpe Hall. 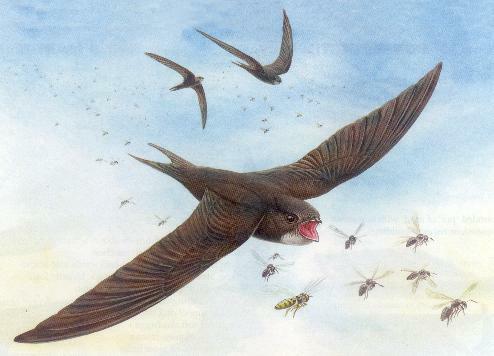 1500hrs One Swift seen to into nest on cottages near to Post Office. It is a already recorded nest site. We met as usual at the Memorial Hall. In attendance was Reg, David, Mary and Paul, and myself. We checked out the regular sites. We started by counting the birds in the sky which at that time was just nine, but later in the watch we counted a total of 28 birds. Most birds tonight were flying low. It was very windy. The first nesting activity was on the front low elevation of the Royal and we witnessed two separate birds going into two sites. No sooner had they passed food then off again, probably the changeover of food was only two seconds. We moved further down to the Coach House and the Manor House, we saw one bird leaving the front elevation site on the Coach House, also we were lucky enough to see a bird using one of the sites on the gable end of the Manor House. Without doubt we saw the most activity in the skies since the beginning of the weekly watches. David mentioned that he had again been witnessing birds coming into his yard, which seemed as though they were prospecting sites for next year on the rear of Reeder House.